The Royal Bengal Tiger (Panthera tigris tigris) is a charismatic keystone species. On the IUCN’s Red List, tigers are labeled as endangered and populations are decreasing, with a wild population of about 3,200 individuals (Goodrich, 2015). These individuals can be found mainly in India and Bangladesh (Loucks et al., 2010). Currently, tigers only reside on about 7% of their historical range, with a 96% population decrease in the past 100 years (Dasgupta et al., 2017). The largest concentrated population of royal Bengal tigers can be found in the protected land split between India and Bangladesh; Sundarbans National Park. Sundarbans National park is a tidal wetland forest delta with an area of about 10,200 square km across India and Bangladesh. The park is made up of the largest remaining contiguous mangrove forest in the world (Dasgupta et al., 2017). Mangroves are specialized trees and shrubs that live in brackish intertidal zones around the coast. 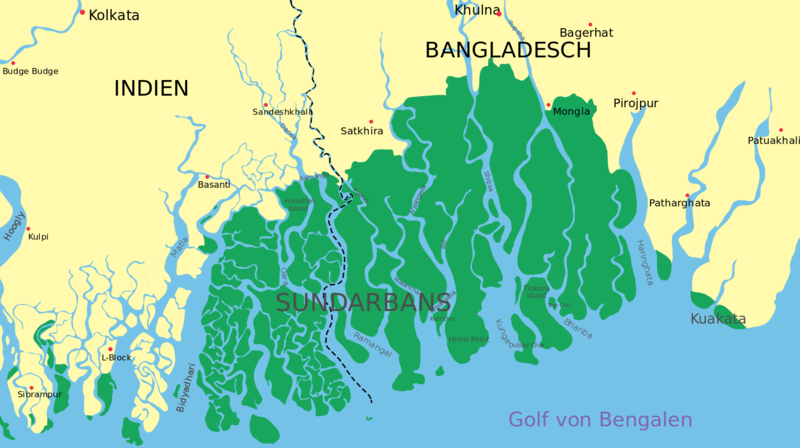 The mean elevation for most of the Sundarbans is less about one meter above sea level (Loucks et al., 2010). The Bengal tigers that live in this park are one of the only tiger populations adapted to living in these mangrove systems. In 2004, an estimated 440 tigers lived in the Bangladeshi side of the park, and in 2015 only 200 were surveyed (Dasgupta et al., 2017). 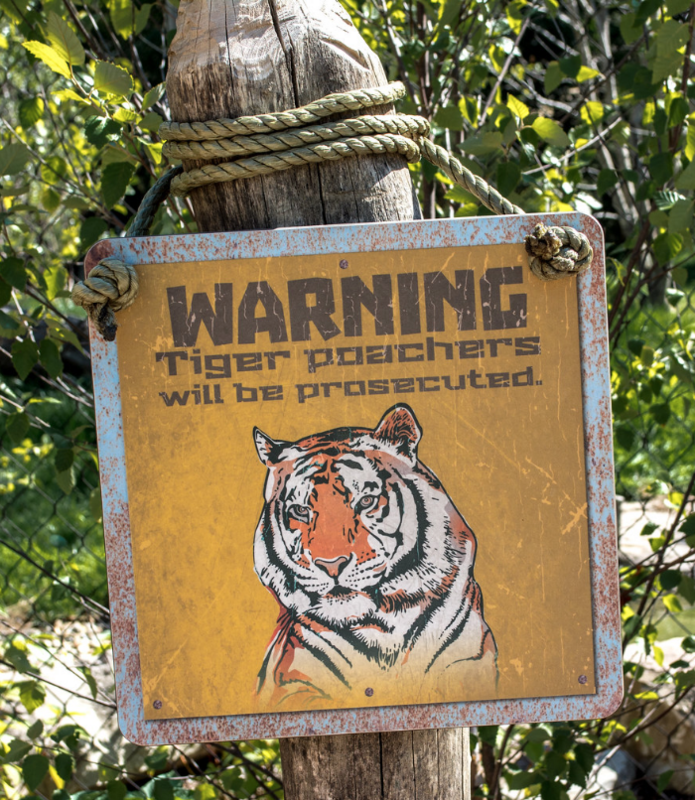 Sign to warn off tiger poachers placed outside of tiger reserves. While climate change overall can damage ecosystems, it also has a direct impact on the endangered tigers through a loss of habitat (Barlow, 2009). Sundarbans unique low coastal ecosystem is susceptible to sea level rise and increased storms, which can cause erosion and increase salinity levels in fresh water reserves. Sea level rise is one of the most currently studied impacts of climate change on the park, since the area is approximately one meter above sea level. Globally, the sea levels are rising by 4 cm per decade (Loucks et al., 2010). This rate of sea level increase is consistent with the both the Fourth National Climate Assessment and Intergovernmental Panel on Climate Changes predicted increase. With this current rate of sea level rise, using a digital elevation model (DEM) of Sundarbans, it is predicted that the park will lose 96% of its land by as early as 2070 (Loucks et al., 2010). 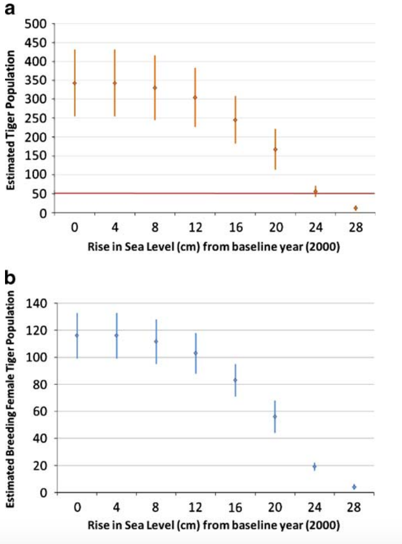 This extreme loss of land which would render the area uninhabitable for tiger populations (Mukul et al., 2019). 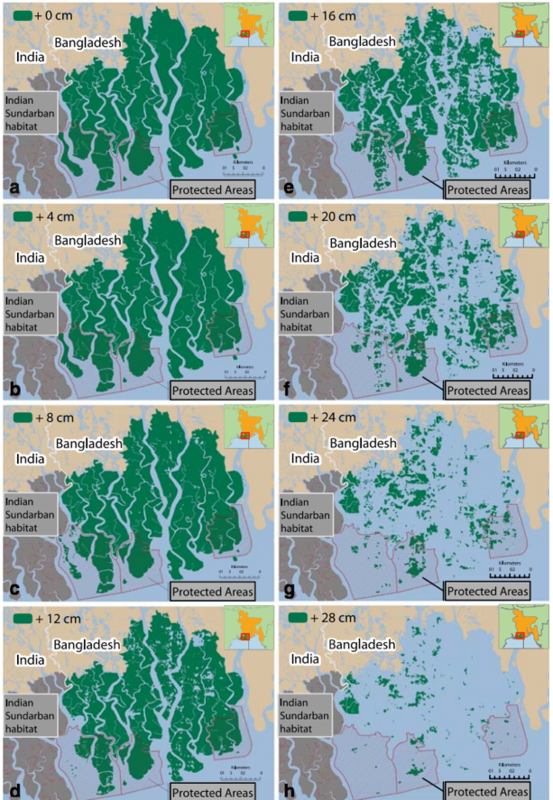 Predicted tiger habitat loss in the Bangladeshi Sundarbans under increasing sea levels. Land area that lies above the predicted sea level is shown in green. 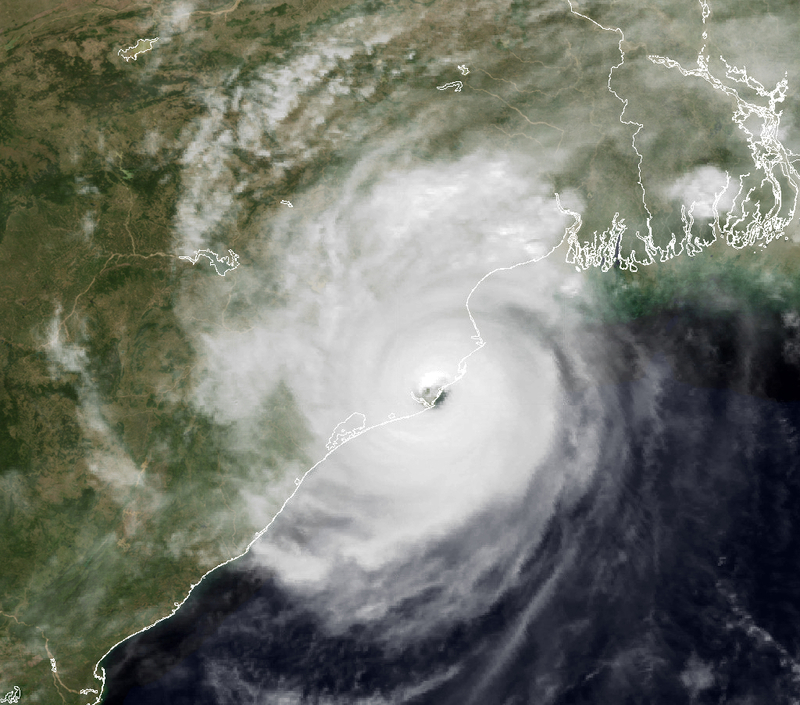 Cyclone in India, October 1999. 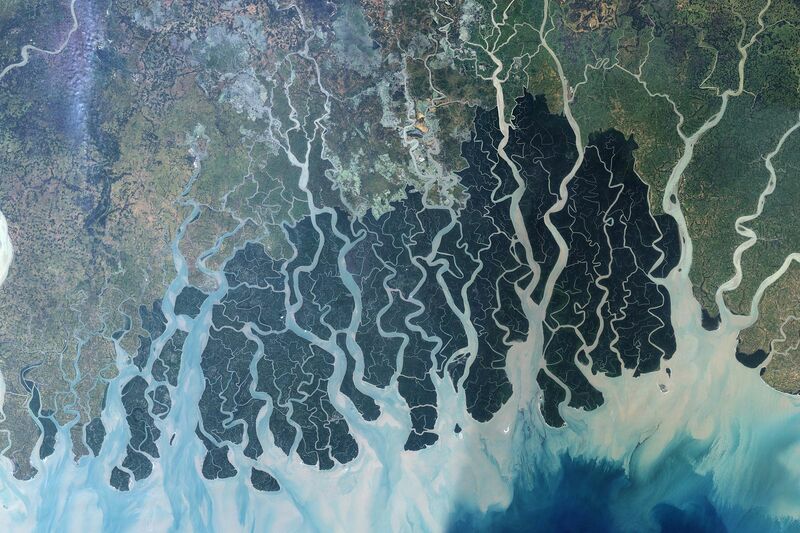 Sundarbans National Park seen on top right of image. Sundarbans National Park is located just north of the Bay of Bengal, and is susceptible to frequent cyclones. In the past 40 years, there has been an increase in cyclone activity, which has had a direct effect on the mangroves. While the mangroves are adapted to periodical storms, they cannot adapt fast enough to the higher frequency and intensity expected with climate change (Islam et al., 2009). An increase in storms will further fragment the tiger’s home range. With storms damaging the essential mangroves and their root systems, coastal landscapes are even more vulnerable to sea level rise. The bank structure is composed of shifting mud and silt which can easily be washed away without the support of roots. Without the mangrove barrier, the coast line will wash away and decrease the area of the park (Dasgupta et al., 2017). 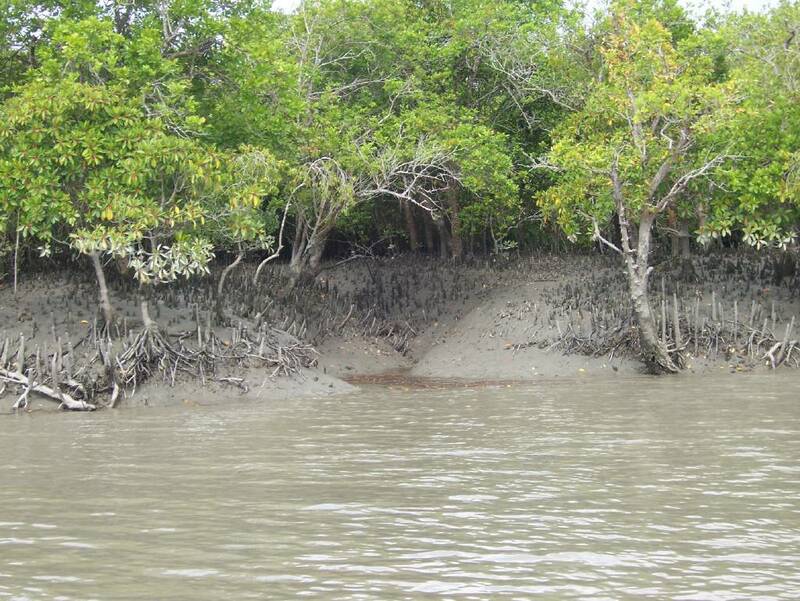 Photo of a mangrove root system beginning to erode along the coast of Sundarbans. NASA satellite image created in 1999, showing the Sundarbans in a deep green. Shows the extensive river pathways connected to the ocean. With an increase in erosion and sea levels rise, these usual freshwater river ways will increase in salinity and turn brackish (Hossain, 2012). In the last 35 years, salinity within the parks river ways has increased around 26 percent (Mahmuduzzaman et al. 2014). These rivers are the only source of freshwater for the tigers, as well as local tribes and communities around the park. If tigers no longer have access to fresh water, they will be forced to seek other water sources outside of the park putting them in direct danger from humans. The mean elevation within Sundarbans National park is one meter above sea level. The low laying land renders the park extremely susceptible to sea level rise (Ahmad et al., 2017). Sundarbans adaptive capacity is reduced by poor socioeconomic development, and a lack of education on tiger conservation and their role in the ecosystem (Das, 2010). Education campaigns to local people might help reduce the risks human-tiger conflict. Support for conservation of tigers will emerge when people believe the conservation efforts can also benefit themselves and their communities (Khan, 2004). Sundarbans is expected to lose 96% of its land by 2070, which leaves very little land available for tiger breeding (Mukul et al., 2019). The remaining 4% of the habitat will support 20, half of which are breeding females. In order for the remaining tigers to maintain a steady population status, a minimum threshold of 50 individuals is needed in Sundarbans. Any less will result in a population extinction (Loucks et al., 2010). The Bengal tiger populations in the Sundarbans is isolated, blocked in on all sides. One side of the park is exposed to the ocean with nowhere for tigers to move, while right outside the park are large villages and communities of people. The tigers are being pushed northwards by the oceans rise, and have nowhere else to go but towards civilization (Hossain et al., 2018). Since 1990, an average ratio of 3:3 people to tigers have been killed each year, totaling about 27 people and 27 tigers (Hossain et al., 2018). There are four hypotheses for why humans attack tigers: (1) fear of the tiger attacking people or livestock in the immediate future; (2) lack of support from local authorities when tigers enter villages; (3) retaliation or revenge for past attacks on people or livestock; and (4) personal or social incentives for killing tigers” (Inskip et al. 2014). 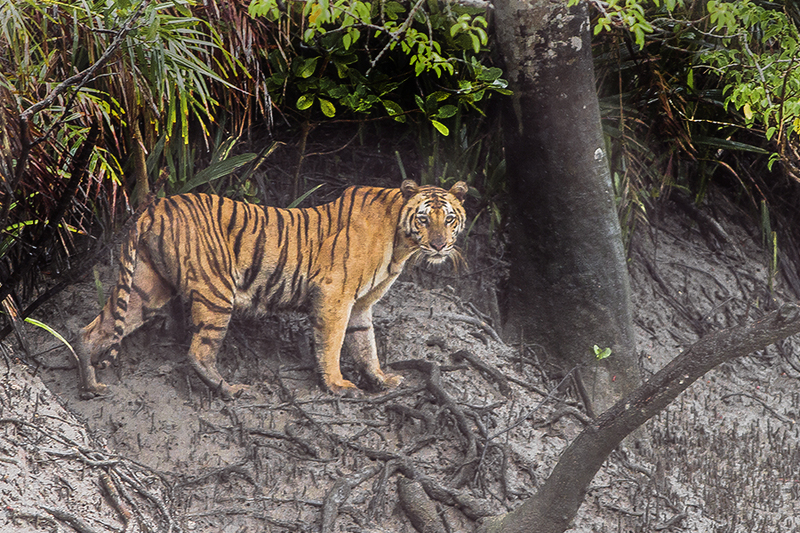 As the sea continues to eat away at Sundarbans shores, human-tiger conflict is expected to increase as there becomes less available habitat for tigers. WWF/IUCN Tiger Emergency Fund (TEF): Provides immediate funds to tiger populations that are at risk of natural disasters (Khan, 2004). Bangladesh restricted any sort of resource extraction from the Sundarbans for one year after the catastrophic 2007 cyclone, to allow for restoration of forest productivity (Khan, 2009). Interestingly enough the plan published by the Bangladesh forest department mentioned climate change only a few times, dismissing the threat as a serious problem. Expansion of the coastal greenbelt through mangrove reforestation is a part of the ten year Bangladesh Climate Change Strategy and Action Plan. The hope is that the increased forest growth will help protect the coastline of Bangladesh from the effects of climate change. 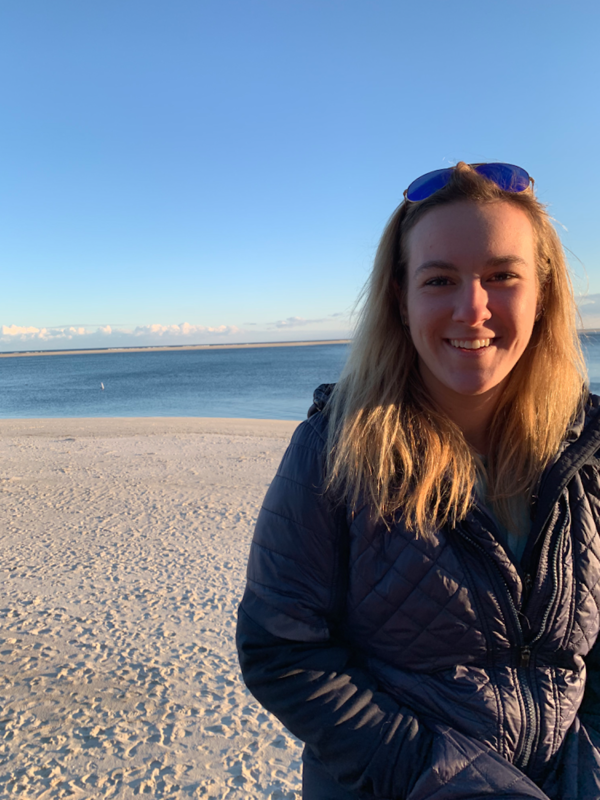 Samantha Smith graduated from St. Lawrence University in 2020 with a bachelor of science in a combined biology and environmental science major. She researched the impacts of climate change on Royal Bengal Tigers for Dr. Jon Rosales "Adapting to Climate Change" in the Spring of 2019. She has always been a fan of studying large predatory animals, and was able to connect some of her passions to the growing concern of climate change.